380 pages | 31 Color Illus. | 142 B/W Illus. 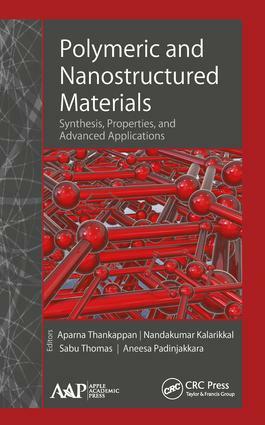 This volume provides in-depth knowledge and recent research on polymers and nanostructured materials from synthesis to advanced applications. Leading researchers from industry, academia, government, and private research institutions across the globe have contributed to this volume, covering new research on nanocomposites, polymer technology, and electrochemistry. Aparna Thankappan, PhD, is a Postdoctoral Research Fellow at the International and Inter University Center for Nanoscience and Nanotechnology, Mahatma Gandhi University, Kottayam, India. She has published over a dozen articles in professional journals and has presented at several conferences as well. She has co-authored several book chapters. She received her PhD in photonics from Cochin University of Science and Technology, India. Her research interests include nonlinear optics, photonics, synthesis of nanomaterials, solar cells, and metal organic frameworks. Nandakumar Kalarikkal, PhD,is an Adjunct Faculty of the International and Inter University Centre for Nanoscience and Nanotechnology as well as Associate Professor in the School of Pure and Applied Physics at Mahatma Gandhi University, Kerala, India. His current research interests include synthesis, characterization, and applications of various nanostructured materials, laser plasma, and phase transitions. He has published more than 135 research articles in peer-reviewed journals and has co-edited nine books. Sabu Thomas, PhD, is the Pro-Vice Chancellor of Mahatma Gandhi University and Founding Director of the International and Inter University Center for Nanoscience and Nanotechnology, Mahatma Gandhi University, Kottayam, Kerala, India. He is also a Professor of polymer science and engineering at the School of Chemical Sciences of the same university. Professor Thomas’s research group has extensive exchange programs with different industries and research and academic institutions all over the world and is performing world-class collaborative research in various fields. The author or co-author of over 750 peer-reviewed research papers, reviews, and book chapters, Dr. Thomas’s work has been cited over 30,000 times. Recently he received an Honoris Causa (DSc) from the University of South Brittany, France, and University of Lorraine, Nancy, France. Aneesa Padinjakkara is a Junior Research Fellow at the International and Inter University Centre for Nanoscience and Nanotechnology at Mahatma Gandhi University, Kerala, India. She is currently working on a project involving "Engineering of Nanostructured High Performance Epoxy/Liquid Rubber Blends with Controlled Nanoparticle Localization," under the supervision of Dr. Sabu Thomas.